Last week I looked at how Pope Francis used the Golden Rule “Do unto others as you would have them do unto you” (Mt 7:12) as an anchor for his call for global change. I ended with an attempt to extend that fundamental Christian philosophy to include a call for sustainable global interaction with the global energy and water cycles. I said, “humans should move away from their contribution to the energy cycle and play a bigger role in the water cycle.” To use a stronger term (but worse English) – we should get out of the energy cycle and into the water cycle. This blog will expand a bit on these cycles. If we Google each of them, we get about 500 million entries for the energy cycle and about 50 million for the water cycle. I spoke about these cycles in my book (Climate Change: The Fork at the End of Now – Momentum Press 2011); I am including excerpts here to give more context to my plea from above. The full energy budget of Earth is presented in Figure 6.5. The outer atmosphere intercepts 341.3 W/m2 solar radiation. For the temperature to remain constant on the average, we need the same amount of energy to be emitted into outer space. About 30% of the incoming radiation is reflected and scattered back into outer space. This percentage is known as the albedo. As we will see shortly, it plays a crucial role in the balance. The remaining 70% is returned to outer space as infrared radiation. 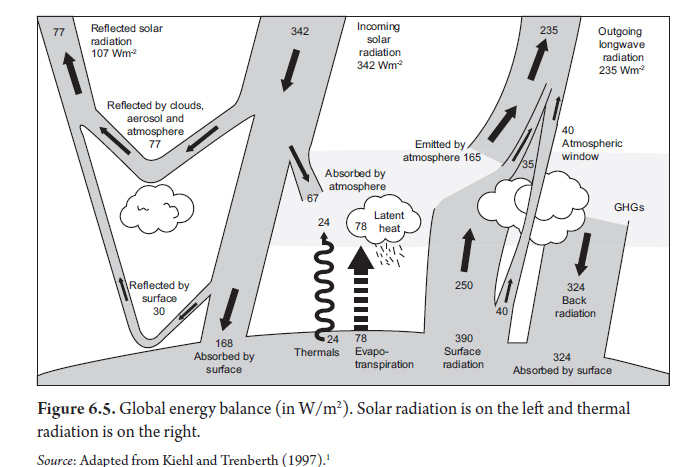 Figure 6.5 shows that not only the overall energy flow but also the regional energy flow is balanced in order to have approximately constant temperature on the surface of Earth. About 70% of the surface of Earth is covered by water. The solar- driven evaporation of water from the oceans is the driving force for the water cycle and is responsible for all the fresh water needed to sustain the biosphere, including humans. As the water evaporates, it rises in the atmosphere together with hot, dry air. As the hot air rises, it moves to regions with lower atmospheric pressure— a process discussed in Chapter 2. In a sense this hot air is performing mechanical work similar to the gas in a car engine that expands by pushing the piston in a cylinder. The energy to perform this mechanical work comes from the internal energy of the humid air, and thus the air’s temperature will fall. As the hot air expands and cools, it can hold less water vapor and eventually becomes saturated. At this point some of the water vapor will condense into tiny water droplets to form clouds (about 1 million cloud droplets are contained in one raindrop). In the presence of small dust particles (0.5– 20 μm in diameter) that can act as condensation seeds, the cloud formation can start below the saturation pressure. Clouds are categorized as low clouds (below 2.5 km above Earth), middle clouds (2.5– 6 km above Earth), or high clouds (above 6 km above Earth). All clouds are white, but when viewed from the ground some appear gray or dark gray according to their depth and shading from the higher clouds. When cloud particles become too heavy to remain suspended, they fall as precipitation in the form of rain or snow. Water that falls on land runs off over the surface as streams, or percolates into the ground to become groundwater. It can return to the atmosphere again by evaporation or transpiration (evaporation of water from plants). Eventually both the surface water and the groundwater find their way back into the oceans. 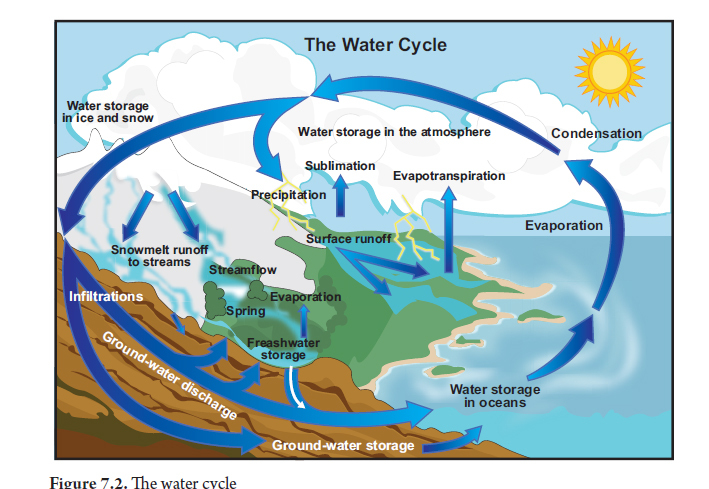 This cycle is often referred to as the water cycle and is shown schematically in Figure 7.2. The driving force of this cycle is solar energy. The cycle involves redistribution of two key ingredients essential to the survival of much of the biosphere, and as a result, any man- induced climate changes are of major importance. The two key ingredients are water and mineral deposits. 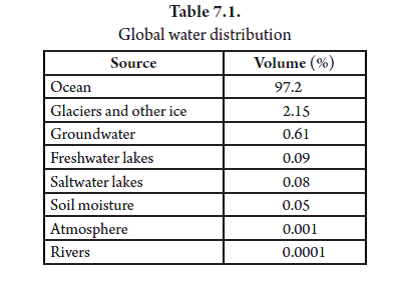 The table (taken from the book as well) shows the Earth’s water distribution. The water cycle is a true cycle in that water is neither being destroyed nor created at any given time (although very small amounts can escape to outer space or the interior of the Earth). There is plenty of water on our planet; the total amount of water on Earth is 1.4 billion km3 (USGS) or about 300 million miles3. This amount is equal to about 20% of the weight of the moon. However, most of this water (97%) is ocean salt water, and is not suitable for either irrigation or consumption by humans or land animals. Solar energy evaporates a little bit of the ocean water, leaving the salt behind, and moves some of it to land where it can fall in the form of rain or snow of fresh water. As a result of this process, only a very small amount of fresh water can be captured to be used between people, plants, and animals. This meager amount is nowhere near enough for today’s use. The World Bank defines water stress as availability of less than 1,700m3/ person. Our planet now houses more than 7.3 billion people, and more than 80 countries are suffering from severe water stress. Most of these countries are poor, but important sections of very rich countries suffer from water stress as well – as is the case with California. I have written extensively (mainly in August – December 2013) on this important issue. Two of the most visible impacts from climate change are sea level rise and changes in the water cycle. In the long term, the remedy to these is to integrate human needs into the water cycle through desalination efforts. This action also serves to integrate the effects of the energy cycle with the water cycle because desalination is an energy intensive process. In comparison to water, the energy cycle doesn’t look much like a cycle. Solar energy comes from the sun and the infrared radiation escapes to outer space. But as I have mentioned before, the balance between the two forms of radiation has to be kept steady in order to guarantee that the average temperature remains approximately constant, and the climate remains suitable for life on Earth. If this balance is disturbed, the system adjusts by changing the climate. It is not very difficult to conceive of conditions that would bring about such changes that would make it impossible for Earth to sustain its current species. Among the billions of stellar objects around us, we have yet to find life in the universe outside Earth (in spite of quite a lot of searching). We continue to look for feasible places to move when our planet can no longer contain us, but for now we’re stuck here and must therefore look after our home. Global energy currently uses roughly 0.001% of solar incidence. World energy consumption is 5.6×1021 Joules/ year (IEA – 2012). Solar incidence on Earth is 5.7×1016 Joules/Year (my book). The ratio in % amounts to 0.001%. The amount of energy that we use is not the problem. Instead, we are seriously disturbing the balance by changing the chemical composition of the atmosphere and changing the albedos by creating conditions for snow cover to disappear, for Earth to adjust by raising the temperature. Mitigating and adapting to anthropogenic global climate change enough for life on Earth to survive longer than a few more generations requires humanity to get out of the energy cycle. This mainly consists of not using fossil-fueled energy, which drastically changes the chemistry of the atmosphere. Instead, in our effort to adapt to the changing climate, we will need to integrate into the water cycle through energy-intensive efforts to desalinate some of the ocean water to meet our needs for fresh water. This entry was posted in Climate Change and tagged Adaptation, Albedo, Anthropogenic, biosphere, California, Clean Energy, Climate Change, cloud, condensation, Desalination, do unto others, Economics, electrical power, Electricity, Emissions, Energy, energy balance, energy budget, energy cycle, energy flow, Environment, Fossil Fuels, Fresh Water, freshwater, Global Population, Global Warming, golden rule, greenhouse gas, Lake, Mitigation, Ocean, Pope, Pope Francis, Population, Power, Power Plants, rain, river, saltwater, Science, Sea-Level Rise, snow, Solar, Solar Energy, solar radiation, stream, Sustainability, Technology, Temperature, vapor, Water, Water Cycle, water distribution, Water Stress, World Population. Bookmark the permalink.